NAS Security installs and sells a range of burglar alarms that are high in quality and performance. A broad range of security systems are available that will suit both the householder requiring only 2 or 3 detectors up to the large system capable of securing a business with multiple buildings. 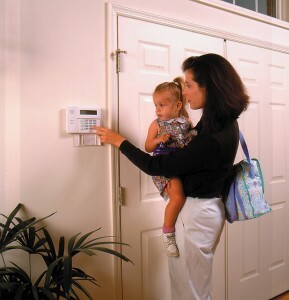 The alarm systems can be hardwired or wireless or a combination of both. An alarm system has divisions called zones. Alarms can have either 4, 8, 12, 16 zones or in some cases even 48 zones or higher. We recommend that only one detection devise is attached to each zone because when your alarm activates you can then determine which detection devise went into alarm in what area. If multiple detection devises are installed on one zone you will not know which devise has gone into alarm and if a device is reporting a fault then it it is a process of elimination which can be costly. We recommend that if your intention is to increase your security detection devises in the future that you purchase a bigger zoned panel from the outset. Some alarm panels can have partitions programmed into them for example the bedrooms in a house at nighttime can remain unarmed whilst the rest of the house is armed. This can be a very comforting feeling for a person(s) knowing that their house is secure whilst they sleep. This is something else that should be considered before purchasing an alarm system because not all alarm systems have this function. Most people that partition their alarm system purchase the pendants/remotes so that they can set or turn the partition off from their bedside.